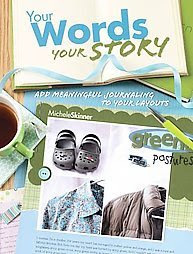 There was one thing that was instantly obvious to me about Your Words, Your Story: Add Meaningful Journaling To Your Layouts by Michele Skinner - there are A LOT of words in this book!! And why wouldn't there be? It is about journaling after all. It definitely took me a little longer to finish this book as compared to other scrapbooking idea books as not only was there generally more editorial content by the author, but it was also easy to see that specific care was taken to make sure that the journaling of EACH AND EVERY LAYOUT IN THIS BOOK was readable! This is often not the case in many idea books. The focus is put on the 'eye-candy' aspect and not on the actual words on the page and it is often way to small to read. In this book, Skinner gives us the best of both worlds - eye-candy and wonderful stories - and I read every single one! Throughout the book, Skinner places a lot of emphasis on finding our authentic voice and using it in our journaling. She defines authentic voice as "the voice we use when we are being 100% ourselves, without fear or reservation." The book is broken out into two parts - each with five sections. PART ONE: Your Words: Find Them! Part One focuses on ways to find existing examples of our authentic voice and follow that lead in future journaling. It also recognizes that it is key to be able to recognize and use outside inspirations (such as quotes, song lyrics, etc.) as jumping off points for our own journaling. Skinner also offers tips for how to recording journaling even when we are away from the scrap table and reminds us to stop putting so much pressure on ourselves to perfect. PART TWO: Your Story: Use It! Part two offers ideas for going beyond the narrative, using journaling as a design element, emoting emotion and more through a variety of journaling techniques. "Whatever you choose to do with your words, remember that you are the author of your own story. What you decide to write and how you decide to write it are completely up to you. Just write; that's all I ask." "The point of journaling is to tell your story. The fun of journaling is to play with those stories any way you see fit." Each of these pages present a journaling-related problem or question that many scrapbookers may face. Skinner addresses the problem with helpful techniques and guidance to solve the question along with a layout example. Now, as I said, there are a lot of words in this book. However, don't think for a minute that it's short on examples! There are 122 layouts featured on the pages of this book by Skinner herself as well as 7 other well-known and talented scrapbook artists including Catherine Feegel-Erhardt, Nisa Finn, Nicole Harper, Crystal Jeffery Rieger, Katrina Simek, Sandra Stephens, and Sue Thomas. In the end, I think EVERY scrapbooker has something they could take away from this book. Whether journaling is already a key component of your scrapbooking or you've been a little standoffish, I would encourage you to check out this book! Visit the Your Words, Your Story page at Amazon.com. You can also read more of my reviews for other recommendations. I have one copy of Your Words, Your Story to give away to one lucky reader!! Leave your comment by Thursday, February 12th, 2009, 11:59 PM (CST) in order to be considered to win. I will announce and contact the random winner via email on Friday. When Life Gives You Lemons: Turning Sour Photos Into Sweet Scrapbook Layouts by Sherry Steveson.